After checking the weight of my baggage, I looked at the queue for the Cebu Pacific, I was surprised to see that it was long and immovable. I arrived an hour an a half so I expected this to happen. But the queue was almost still and is not acceptable. 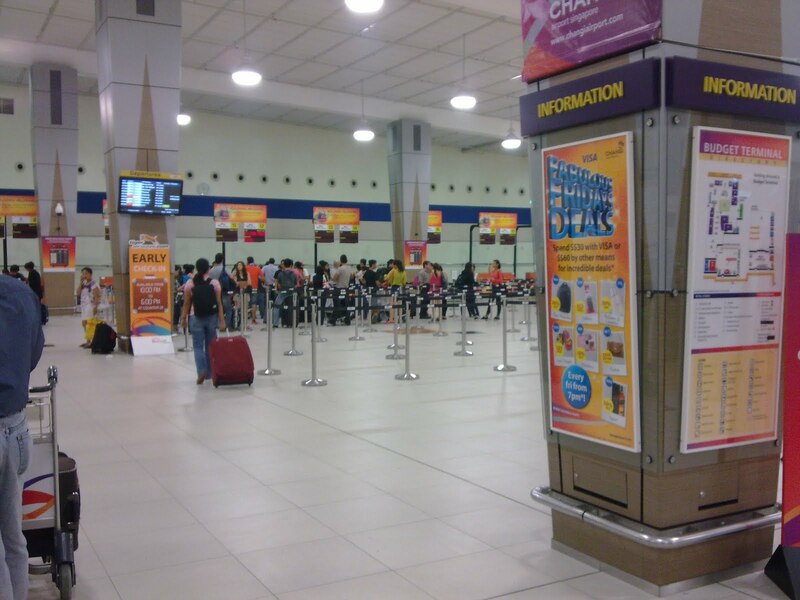 There were three booths, two were the normal check-in and the other is labeled web check-in. I'm not familiar on the web check-in thing so I just stayed at the normal one. Fifteen minutes had past and still the queue was not moving. 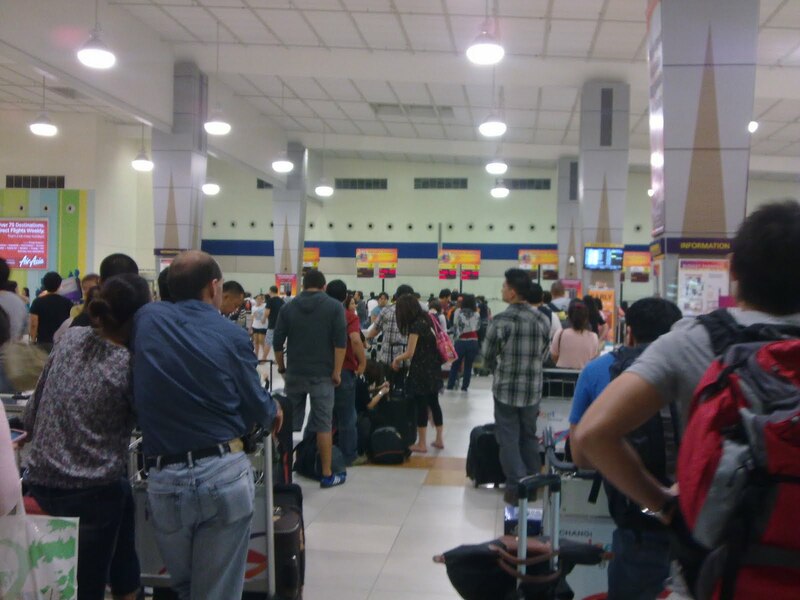 The Cebu Pacific queue stretched until the main door of the Terminal. I was almost leaning at the window glass when taking this photo. 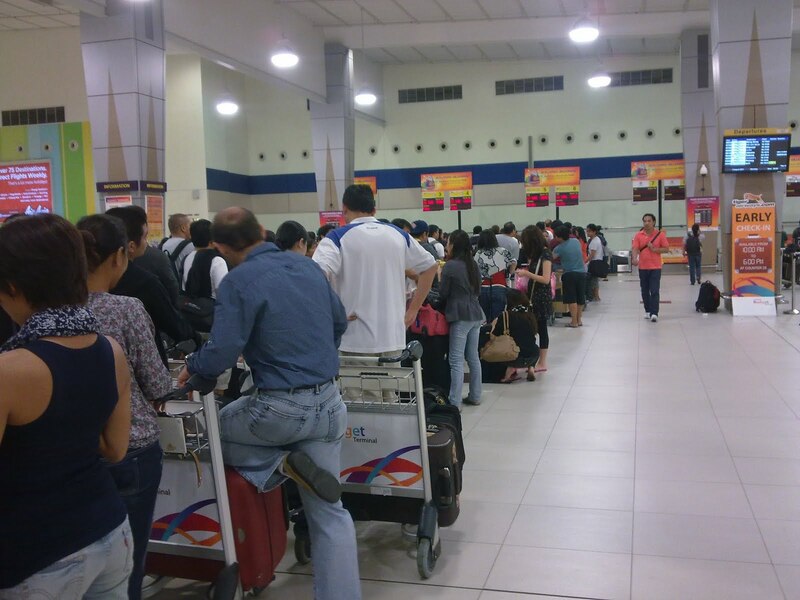 I looked at the queue for the Tiger Airways. 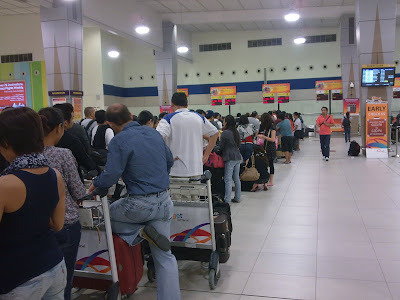 The queue is so calm and is systematically arranged with queue-guiding rails. Cebu Pacific should have done this also. I was playing with my phone games when a women ran speedily to one of the booth. I looked at the farther side to see what's going on. The man started to open another booth so Ben started to open his shirt buttons revealing the big S (Superman) logo on his chest...and with a blink of an eye, Ben is at the 5th place on the new queue. The man opened a new booth at that far right. Kidding aside, I was able to be at the nearest position on the new booth. I looked at the queue where I was previously positioned and thought that those people back there were envied by me like Angry Birds, ready to swing, aiming at me. But even I was on that new queue, it took me 10 mins to check-in, my goodness. What's your experience with the Airline?